Signing up for a new health insurance plan can seem a bit challenging, especially if it’s your first time. But don’t worry. We’ve got you covered with these tips on how and where to select your plan. If you’re signing up for an Affordable Care Act (ACA) plan, then there are three potential paths to follow when choosing coverage for 2017. You can purchase a plan through the federal government’s Health Insurance Marketplace, buy directly from a health insurer such as Blue Cross and Blue Shield of North Carolina or purchase through a licensed agent. Here are some tips on where and how to purchase ACA coverage and things to consider when making your decision. The answer to this question depends on whether you qualify for a subsidy to help pay for your monthly insurance premium. If you qualify for a subsidy or would like to do some comparison shopping between health insurers, then the Health Insurance Marketplace, also known as Healthcare.gov, is for you. Not sure if you’re eligible for a subsidy? This Health Insurance Marketplace Calculator can help – but remember, only the federal government can determine the eligibility for and amount of a subsidy. If you don’t qualify for a subsidy and already know you want to purchase a BCBSNC plan, then you may go directly to our website. Or you might contact a licensed agent or visit one of our retail stores. Premiums: The monthly premium is what many people want to know right off the bat when choosing a health plan. Network: This determines the doctors, hospitals and pharmacies that are covered by your plan. Copayments, Deductibles, and Coinsurance: Each plan has a different set of options for yearly deductible, copayment and coinsurance choices. These determine how much you’ll pay for care out of your own pocket. Metallic Level: The metallic levels of plans reflect the value of your coverage. Each plan level covers a different amount of your medical costs. You can buy ACA coverage for 2017 through the Health Insurance Marketplace during the Annual Enrollment Period (AEP), which begins Nov. 1 and runs through Jan. 31, 2017. Outside of this window, you will have to qualify for a Special Enrollment Period to purchase a new plan or change your existing one. It’s always helpful to research your plan options to determine what best fits your needs. You should also make sure your application is as accurate as possible to ensure correct subsidy information and a smoother enrollment process. Go to Healthcare.gov and click on “Get Coverage” to start browsing plan options. If you don’t qualify for a subsidy, you can purchase your plan directly through our website or one of our many licensed agents. To find an agent visit our Find a Local Agent page. If you need help purchasing an individual or family plan, please call 1-800-324-4973. You can get a free rate quote and begin your application process. Once you have filled out your application, you will then be able to browse and compare our different plans. Just like with the Health Insurance Marketplace, you’ll need to complete your application between Nov.1 and Dec.15, 2016, to be eligible for coverage beginning Jan. 1, 2017. Plans for 2017 are available for purchase through Jan. 31, 2017. After that, you’ll need to qualify for the Special Enrollment Period. When you need help, have questions or need to make a change in your application or coverage, you won’t necessarily go back to the Health Insurance Marketplace or BCBSNC. Consider how you make a purchase from your favorite online retailer. If you have a question about your product, you’ll contact the product manufacturer or seller. But if you have a question about your account or billing, you’ll contact the retailer. Similarly, who you should contact when you have an issue with your health insurance depends on the type of issue you’re having. If you purchased your plan through the Health Insurance Marketplace, you’ll need to contact someone through Healthcare.gov (1-800-318-2596) regarding any changes to your address, marital status, employment, income or questions about your application status or subsidy eligibility. Please note that Marketplace rules don’t allow insurance companies to report these “life changes” for you. For questions about your network, benefits, coverage, premium billing or prescription formulary, you’ll need to contact BCBSNC. You can contact us by phone or via Blue Connect, our website for members, where you can access benefits and coverage information. Or you may chat live with one of our customer service professionals. If you purchased your health insurance plan through a licensed BCBSNC agent, your agent can help if you have questions. 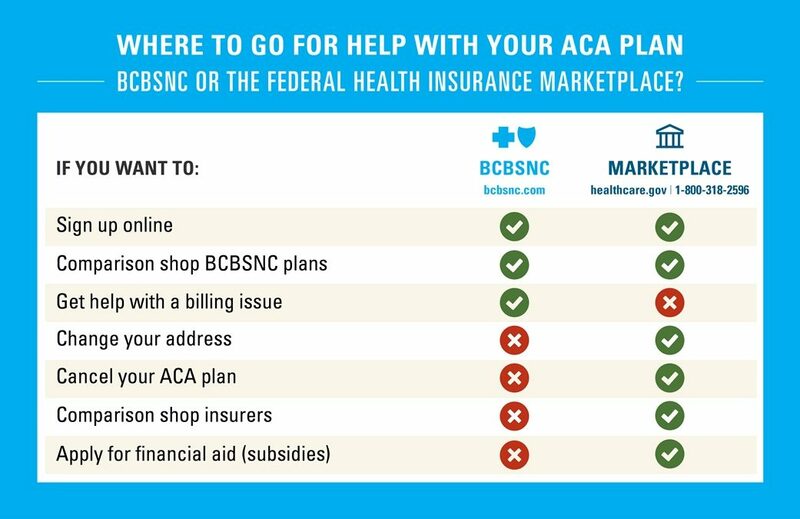 You might still need to contact BCBSNC for answers to some of the more complex and specific questions about your policy. Knowing who to call and when can be confusing. And choosing an insurance plan is an important process for any individual or family. We want you to make the right decision for you or your family, and we are here to help answer your questions.